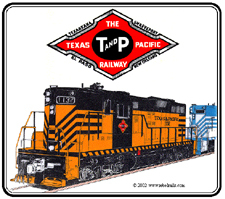 T&P was part of the Missouri Pacific for most of its life, now part of the UP RR family. Products bearing individual marks are licensed marks owned by Union Pacific Railroad Company and are used under an active license agreement. 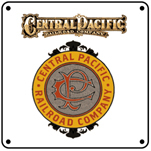 6 inch x 6 inch square tin logo sign or the Central Pacific Railroads logo. The Central Pacific was the "other" Golden Spike railroad meeting the Union Pacific at Promontory Utah on May 10th, 1869. Beautiful coffee mug featuring GP diesels of the Texas & Pacific Railroad along with logo on the reverse side. Swamp Hollow Orange and black was the color of most of their GP freight diesels. GP freight diesels of the Tesxas & Pacific Railroad in classic swamp hollow orange and black. 6 inch x 6 inch square tin logo sign of the Texas & Pacific Railroads GO T&P logo. Rare logo in todays world. 6 inch x 6 inch square tin logo sign of the Texas & Pacific Railroad. 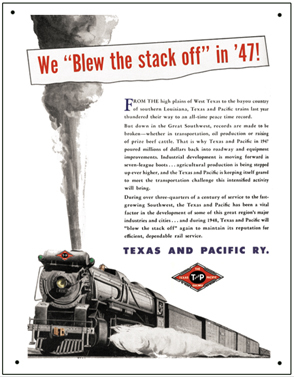 Reproduction of an ad ran by the Texas & Pacific Railroad after WWII. 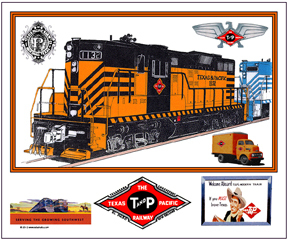 Diesel and images of the Texas & Pacific Railroad in the 1950s, with a T&P Motor Freight truck.